Tom has been passionate about music and radio from an early age and bought his first set of DJ decks and mixer at the age of 13. After spending several years DJing to bedroom walls and then to crowds in clubs and bars, it was by no real chance that he was drawn towards the student radio stand at the University of East Anglia’s Fresher’s Fair whilst studying for his undergraduate degree. 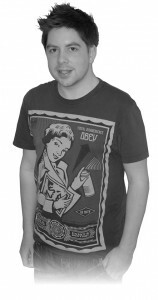 Tom spent three years at UEA’s student radio station Livewire 1350AM, starting out by presenting a weekly specialist dance music radio show “The House Sessions”. He soon became hooked and at the end of his first year at Livewire, was elected onto the station’s committee team as Head of Specialist Programming. Over the next two-years he presented a combination of specialist music and general daytime shows and in his final year was elected to become Head of Production. It was during his time at Livewire and through various radio station work placements that Tom realised he loved creating and producing great radio and ultimately wanted to pursue a career in the radio industry. After somehow finding enough time to fit his university work around Livewire and DJing work, he graduated from UEA in 2008 with a degree in Business Information Systems. Tom began work as an E-Learning Developer at a Technology College but still managed to continue gaining experience in radio. He started presenting the weekly “Saturday Night In” on Derbyshire-based radio station, Amber Sound FM. After working for almost two years as an E-Learning Developer, Tom decided to take the plunge into achieving his radio aspirations and enrolled onto the MA Radio Production course at Bournemouth University to gain relevant production skills and further his knowledge of radio and production.